Planning to get an electric guitar? Now I know this may seem like a big thing taking all the top brands and everything into consideration, however with a little research and insight you can easily get a guitar that is both suited to your needs and budget. Without further ado, let’s get started! Now I can imagine very well if you want to get the latest Fender which has hit the market, but seriously you are looking at expensive price tags here. High quality guitars can very easily top the $3,000 range and you are best to consider your options before you make your purchase. Having said that, I do not discourage you from buying high end guitars, by all means if you can afford one then go for it. This is extremely important because the higher the quality of the instrument, the better the experience you will have playing it. This is obviously a very personal decision and you will need to know for sure how much you are willing to spend here. Another thing that you need to know is that cheaper guitars are not essentially poor in quality. 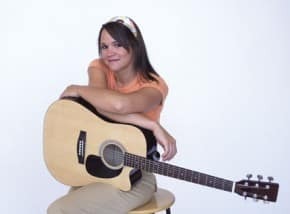 Due to computer aided manufacturing techniques, guitars, especially electric ones are now being made at less costs without sacrificing on quality. You can get excellent guitars for $150-$250 of appreciable quality these days which would have probably cost 3 to 4 times as much about 20 years back. 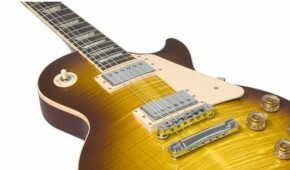 An electric guitar produces sound via an electric pickup that is installed below the strings. The pickup collects the vibrations of the strings and transfers them to an amplifier. A pickup is essentially a small device that is made of a magnet surrounded by a very fine metal wire (at least most of them are). As the guitar strings vibrate within its magnetic field, it produces a very small electric charge which is fed to an amplifier which boosts the signal and further on feeds it to the speakers. Because electric guitars use only a pickup they do not require a hollow body as is seen in a traditional acoustic guitar. In fact most electric guitars are made out of solid wooden or plastic body. However this does not mean that you can have an electric guitar made out of anything; the material used in the body still has a great impact on the quality of the sound that the guitar produces. There are four types of electric guitars are there for you to choose from. 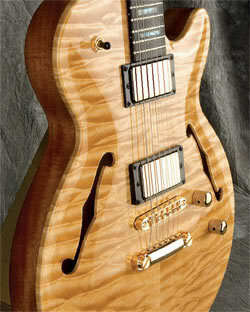 These are the Solid body guitars, Hollow body guitars, Semi-hollow body guitars and the Chambered guitars. 1. 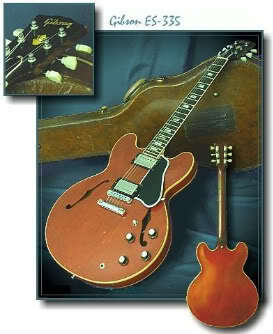 Solid body guitars: The most commonly known design for the electric guitars. These can take virtually any shape from just a neck and pickups to wild and star shaped designs. Given the kind of shapes these are available in these are also the most popular ones around. 2. Hollow body guitars: These guitars are generally speaking just normal acoustic guitars with pickups on them and are favored by jazz players for their full round tones, however they are best played at a low volume setting. 3. 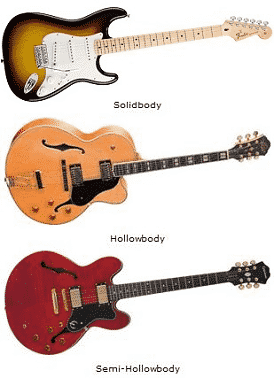 Semi-hollow body guitars: Best suited for a range of music ranging from jazz to punk, semi hollow body guitars have a wooden center with large holes on either sides to avoid feedback issues commonly seen in hollow body guitars at high volume settings. 4. Chambered guitars: Are essentially solid body guitars which have sealed chambers carved into them to both decrease the weight and also increase resonance. a. 25 ½”: This was the original length of steel string acoustic guitars and was adopted by Fender onto its Stratocaster and Telecaster models. Guitars made to this length offer a high tension and trebly noise. Since it is slightly difficult to play guitars on this length, most guitarists opt for lighter strings. b. 24 ¾”: This is the scale length of most Fender guitars. As these require a lower string tension, they do not produce as much treble. Usually guitars built to these lengths are equipped with heavier strings which produce a heavier note more suited for adding bass. The most famous guitars built on these scales are the Gibson Les Paul, Gibson SG, Gibson ES-335 and the Gibson Flying V.
c. 25”: PRS Guitars has opted to make guitars on this length which produces a very unique tone and is slightly easier to play. a. The Single Coil: This consists of a single bar magnet surrounded by a very fine wire which produces a small electrical current every time a string resonates within the magnetic field. These were the first and most preferred types of pickups used in guitars. b. Humbucker: These have two coils wrapped opposite to each other so that they eliminate the humming noise which was a common problem in single coil pickups. These also produce a smooth, round tone. Some humbuckers also give you the option to switch to a single coil mode where you can get the characteristic single coil sound. c. Piezo: Piezo pickups are made of a crystalline material which produces a very small electric current as compared to the other magnet based pickups. These require pre-amplification before they are fed to the amplifier. Piezo pickups are added to the guitar’s saddle. a. Maple: Is used in the making of the guitar’s neck, fretboard and top body. Maple wood is best known for its tonal qualities. b. Mahogany: Is dense and strong, but really hard and is used in the making of the guitar back and neck. Mahogany is a very resonant wood and tends to emphasize the guitar’s sustain. d. Ebony: Is extremely hard and is mostly used in electric guitar fretboards and also in the construction of more expensive guitars. a. Bolt On Necks: Are attached to the body by three or four screws which run through the back of the body and into the back of the neck. These kind of necks are easy to replace and fix should something break. Bolt on necks were also pivotal in making the electric guitar cheap and affordable. b. Set Neck: Consist of necks which are glued to the body. These sometimes have a tenon which is an extension which reaches from the fretboard and goes deeper into the body. c. Neck Through: These include guitars which are built around a single column of wood which starts from the headstock all the way to the tail. a. Two point rocking tremolo: AKA the Fulcrum Vibrato, has individual saddles for each string, which are adjustable for tone and intonation. These are attached to a bridge that rocks on 2 bolts on the guitar. The bridge itself is attached to the body by way of a floating plate which is attached to the inside of the guitar by stretch springs which match the tension of the strings. b. Locking Vibrato: Similar to the 2 Point Rocking Tremolo, only it clamps the strings and works concomitantly with clamps at the head nut down. This was designed by Floyd Rose. c. Stop-bar tailpiece: A stop bar tailpiece is attached to the top of the guitar and provides a string terminus that gets the maximum resonance from the guitar. d. Tune-o-matic bridge—originally developed by Gibson in the 1950s, this is a very common design that allows for individual intonation of strings and overall adjustment of string heights. e. Bigsby is a specific brand of spring-loaded vibrato that appears on many vintage and vintage-style guitars. It is a large, relatively heavy device that includes a rotating bar on which all of the strings attach. Many players like the vintage vibe of a Bigsby. f. Six-point rocking trem—This was the original rocking vibrato designed by Fender in the 1950s. Like the two-point trem, it is through-body, spring-loaded, and provides individual string intonation and height adjustment. Some players feel that because this type of trem rocks on six screws it provides greater vibration transfer to the top and hence better resonance. It is found on vintage and lower-end guitars. Buying a guitar need not be the toughest thing in the world. As said above keep your interest in perspective and go for the guitar that you think well suits your tastes and preferences. Music can be an expensive hobby; this especially so if the hobby in question is guitars. Good quality guitars can indeed cost a small fortune so if you are an avid guitarist and would like to go in for that top quality Fender or Gibson then, by all means go in for them. Music is indeed a passionate hobby and if this is what you choose to do for a living then don’t let anything stop you from pursuing your dream guitar!